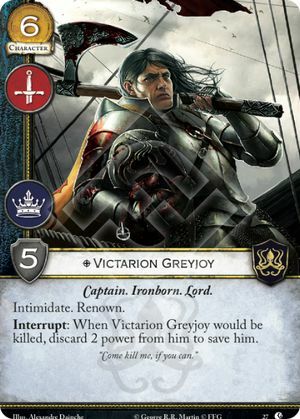 Interrupt: When Victarion Greyjoy would be killed, discard 2 power from him to save him. "Come kill me, if you can." Lions of Casterly Rock #27. I foresee every Greyjoy running 3x (At the very least 2x) of him for the very far future. An intimidate and renown lord combo on its own is great. I believe the last time we saw this was with King Bob in the Core. His ability to be saved coupled with Valar is going to be really appealing to many Kraken lovers.